There’s a nagging feeling that Art Basel Miami (formerly called Art Basel Miami Beach) is a big commercial circus, where a slice of the world’s wealthiest collectors, curators, and financiers fly southward to partake in the largest art fair in the U.S., paired with the most outrageous parties the art world can dish out. That said, the experience is one worth saving in the proverbial memory bank. Not only does the fair offer a chance for international galleries to present their best works, but it also acts as a conduit for other creative professionals. Networking is made harder in this field thanks to spontaneously-generated shells of pomposity, but the skin becomes a little thinner when the weather lets you change into board shorts (if you find time) after a long day stomping through the Miami Beach Convention Center. An exterior view of the Miami Beach Convention Center. Photo courtesy of Installation Magazine. Highlights from the twelfth edition of Art Basel Miami saw some bold initiatives: there seemed to be a trend of suspension works, installed both above the viewer and down to the floor. The effect of floating art (pardon the pun) lightened the atmosphere of the fair to a significant degree. 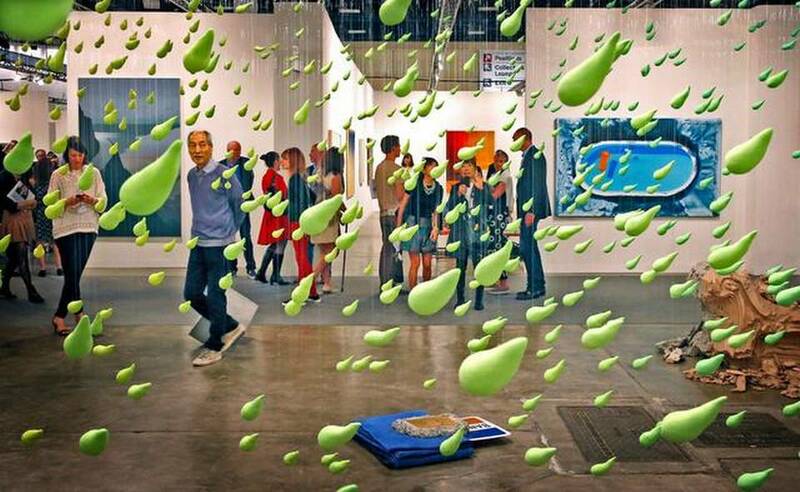 Arguably the most lighthearted setup of the main “Galleries” section belonged to Sadie Cole’s HQ, a London outfit that capably simulated a rainstorm of green blobs suspended in midair. Urs Fischer is known for his humorous jabs at contemporary form, using clay sculptures and inflatables (a neo-Dadaist language) to torpedo the self-imposed “serious” art world. The booth became a kinetic field of fluorescent green droplets hanging from fishing wire, and visitors also had to dodge sculptures of an oversized credit card holder and other quotidian forms on the floor. Another canopy-like piece was noticeably darker in tone, courtesy of Mircea Cantor inside Rome-based Magazzino’s booth. 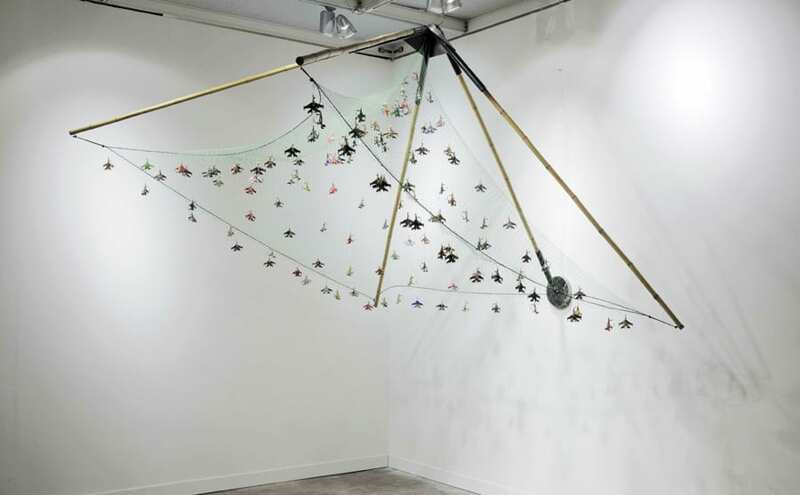 Fishing Flies employed an outstretched fisherman’s net hovering overhead; hanging from that, on fish hooks, was an array of tiny fighter jets hand-formed from soda cans. The metaphor of “raining death” not only resonated from the sensation of a fishing net engulfing and suffocating anything moving below it, but also from the little warplanes strewn across it. Los Angeles-based artist Pae White made a stunning impression in kaufmann repetto’s booth with a flurry of painted paper and mirror-like vinyl shards hung from ceiling to floor with razor-thin aluminum threads, giving the impression of a school of fish at rest in the ocean. Effectively, a sculpture in perpetual motion. Other notable presentations included a mammoth Alexander Calder mobile from Helly Namad Contemporary (London), Hannah Wilke’s iconic sculpted vulvas from Alison Jacques Gallery (London), an exemplary postmodern visual exercise from JPW3 and Sayre Gomez in the Michael Jon Gallery (Miami) booth within the Nova sector, and a charming Yinka Shonibare MBE wax mannequin ascending a ladder (whose steps are fashioned from art history books) at James Cohan’s (New York) stand. A prevalent trend of works hanging (in mid-air) often carries symbology of having ‘strings attached’ or having an invisible ‘puppet master’ orchestrate a show for his audience. 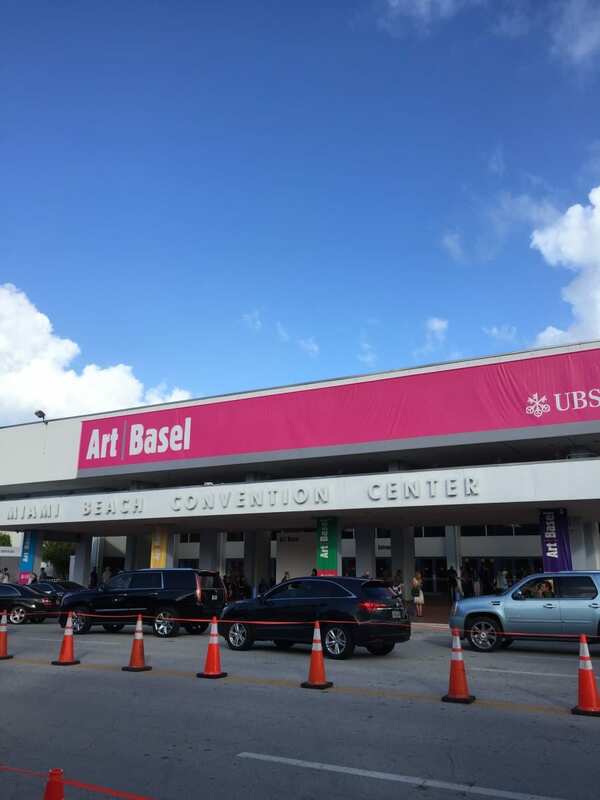 Art Basel (as a commercial entity) has a way of inspiring these associations, but it makes the experience no less engaging and no less attractive to visitors both savvy and naive from around the world. We’ll gladly stand up (for hours and hours) and enjoy the show. 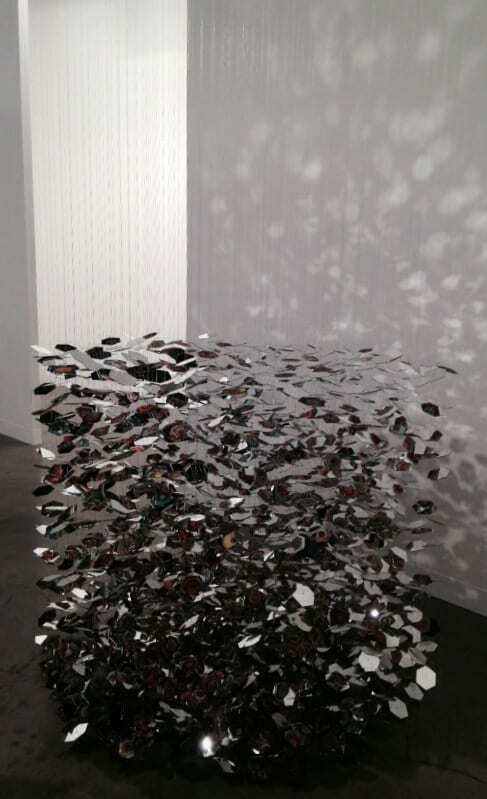  Archived in Art, Contemporary and tagged Art Basel, Floating Art, Miami, Mircea Cantor, Pae White, Urs Fischer. Bookmark the permalink.